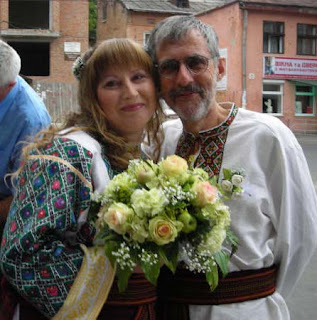 We got married on August,4, 2007 in the West Ukraine. The Church ceremony of our marriage took place in Lviv Greek-Catholic Church of Divine Wisdom . This wooden Church was built in 18 century. Almost all the guests on our wedding were in traditional Ukrainian clothes. Also the Veseli Halychany band from Ternopil were playing at our wedding reception. They are professional musicians and they have two Honour Artists of Ukraine in the band. Here you can see some videos of our wedding fun! So click on the images below and enjoy :)!